As internal strife continues to rip apart Zanu PF, former deputy minister of Energy Munacho Mutezo (pictured) has now officially left the burning governing party to join the fledgling Zimbabwe People First (ZPF) led by former Vice President Joice Mujuru. Since 2014 — when Zanu PF charged Mujuru with treason, witchcraft and corruption, several top officials have been ditching the deeply divided ruling party — and insiders say more are lining to jump ship “as they have realised that the ruling party will not take Zimbabwe anywhere”. Zanu PF central committee member and minister of State for Manicaland province Mandi Chimene confirmed to the Daily News that Mutezo had formally told the province that he was joining Mujuru. “Mutezo is now a People First member, after he told us that he was leaving Zanu PF. All that we did as a province was to follow the normal procedure that follows after someone has decided to join another party,” Chimene said. While Mutezo was not immediately available to substantiate the development, ZPF spokesperson Rugare Gumbo confirmed to the Daily News yesterday that the former Energy deputy minister had indeed joined them. “We have been working with him for quite some time now and he has been taking part in many of our programmes attending meetings. I do not know what you want to call that. You can get in touch with him and hear it from the horse’s mouth,” Gumbo said. Gumbo’s deputy, Kudzai Mbudzi, had earlier told this paper that ZPF had since lost count of the number of Zanu PF officials crossing the floor. “I do not think that we can still refer to ZPF as an opposition party because all the people who were previously Zanu PF have joined us so it is them who are now in opposition if numbers are anything to go by. We are now in the majority with many having joined us physically while others have joined spiritually. They are flocking every day and we cannot keep track anymore,” Mudzi said. 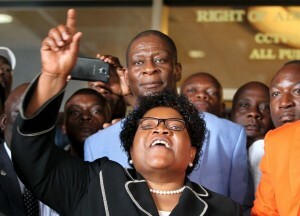 While Zanu PF has adopted a “carrot and stick” approach towards officials deemed sympathetic to Mujuru, readmitting some who had been suspended for up to three years on allegations of flirting with ZPF, insiders in the governing party told the Daily News that Mutezo’s fate was sealed when “he committed the cardinal sin of turning down president Robert Mugabe’s overtures to woo him back”. Mutezo, the insiders say, was offered an opportunity to return to Zanu PF but he had made his decision which prompted the Manicaland party leadership to recommend his expulsion. “Mutezo went wrong when he refused the offer to return to the fold with the promise of being re-appointed minister in the future,” the source said. Last month Mutezo — who was serving a three-year suspension — had his case referred back to the Zanu PF provincial disciplinary committee by the Zanu PF national disciplinary committee — something insiders say was an attempt to lure him back into the governing party.